During the Season of Lent, my congregation sings a verse from the prophet Joel before the reading of the Gospel, “Return to the Lord your God, for he is gracious and merciful, slow to anger and abounding in steadfast love.” That is our mantra for the 40 days leading up to Easter. Last week, on Ash Wednesday, I invited my congregation into the disciplines of Lent. All of the disciplines have the same goals—to draw us closer to God and to our neighbor. The disciplines of Lent that have been passed down from generations past are fasting, prayer, and sacrificial giving. It was this last one that I pondered as I prepared for tonight. Usually we think about that giving at an individual or perhaps congregational level—putting money aside each day for a charitable cause instead of buying gourmet drinks at the coffee shop. But what if we heard the call to sacrificial giving as an invitation to think about how we use our collective resources as a greater community? What if returning to God and neighbor made us look at the ways we organize life together to lift up the neighbor who is marginalized? The city of Nampa is in the middle of revamping its strategic plan. I have been attending the meetings at the civic center, marking up maps, posting sticky notes, writing observations on surveys. This all takes place in the aftermath of two outside organizations, the Robert Wood Johnson Foundation and Invest Health, doing deep dives into the community and lifting up priorities—affordable housing, food access, transportation, and gender and Hispanic equity. I know that this issue is difficult. Most people recognize the need for affordable housing but do not want it to inconvenience them. My congregation has first-hand experience. We know what it is to be scorned and torn apart by wading into affordable housing. For 20 years, when you walked out of Trinity Lutheran Church and looked across the parking lot you saw a tall wooden fence. In the mid-90s, Mercy Housing approached Trinity and asked if they could lease the land around our parking lot for a dollar a year and build 16 low-income houses, appropriately named New Hope. The proposal and final agreement were surrounded by controversy, summed up in the initials TLC no longer standing for Trinity Lutheran Church but That Lutheran Church. Neighbors and a number of Trinity members did not want those people (people who qualified for low-income housing) in their backyard. The fence sat on the leased land and was put up for good reasons—privacy for the residents, safety for children (the backyards back right up against our parking lot), and to block the view of the backyards from church members and people driving down Midland or Lone Star. During those initial 20 years, sections of the New Hope fence occasionally toppled over. The church secretary would make a phone call and the managers would send someone to put the fence back up. One Sunday morning in 2013, we listened as the wind rattled the roof of our sanctuary. This was more than a strong wind. After worship people rushed out to the parking lot and saw that several New Hope roofs had been seriously damaged, and four large sections of the fence had blown over, a few landing on vehicles. This would require more than a quick trip to repair. Mercy Housing’s management company decided to tear down the whole fence. Then the questions came, when will they replace it and what will it look like. The ground was frozen, so Mercy Housing and Trinity waited for spring. Gradually we began to hear fewer questions and more comments, comments about how nice and open the landscape looked and how well kept the backyards were. A few months later I followed up again with the management company and was told there were no plans to replace the fence. That was the beginning of a new chapter for the people of Trinity Lutheran. We started with a block party, for which our neighbors could now simply walk across their backyards, rather than around a fence. Two years later, when Mercy Housing called us about purchasing our land, the residents were no longer “those people.” They had faces and names. And still, the memories of our chapter twenty years ago were fresh for many of us. I have watched the videos of what happened twenty years ago when Trinity Lutheran Church and the Sisters of Mercy worked for three years to make New Hope an affordable housing neighborhood reality. The same Not in my back yard, NIMBYsm that existed then still exists today. Almost everyone recognizes the need for housing, but no one wants it in his or her backyard. Parishioners have told me they can afford their mortgage but if they had to rent, they could not afford the current problem. So, this is not someone else’s problem. It is ours collectively. Obstacles for eliminating homelessness are numerous. They are simple to identify but challenging to overcome. We face a clear lack of affordable housing, prejudice towards the homeless, lack of understanding about the causes and effects of homelessness, systems that create gaps (you do not have enough income for x but you have too much income for y), no safety nets for people who are one crisis away from missing a rent payment (your cash flow is fine until your car breaks down and/or you have a significant medical bill), too few landlords who accept tax credit housing, and a lack of education of how to be good stewards of homes (tenants who damage rentals upset landlords which leads to broken relationships). What is possible? Really possible in Nampa, Idaho? Here is where I find the voice of the Biblical prophets so helpful. The prophet Isaiah is sent to bring messages of judgement and warning similar to those of other eighth-century prophets. He condemns hypocritical worship, complacency, and the failure to act with justice for the poor. But Isaiah also speaks words of promise. 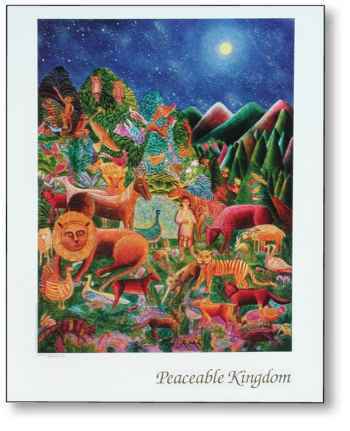 In Chapter 11 he portrays with words the promised Messianic Kingdom, often referred to here as the Peaceable Kingdom. To begin with, the family tree of Jesse, Israel’s greatest King David’s father, is now only a stump. God will make it grow a new branch. But the text says much more. All creatures are included in the kingdom of peace. For now, to be sure, God’s created order includes predators and prey. But Isaiah’s vision of the peaceable kingdom includes wolves and lambs, calves and lions. What’s more? They are all lying down together. John August Swanson’s serigraph of The Peaceable Kingdom has hung in my office for my entire ministry, first in rural Iowa and for eight years in Nampa. It gives me hope on my darkest days. It gave me hope when Mercy Housing approached Trinity Lutheran about buying the houses and ending the 50-year ground lease a few years ago. It gave me hope when our board was called on the carpet by the County Tax Assessor and we had to sit in front of the County Commissioners and plead our case. Sitting in that room I felt ashamed, like we had done something malicious and were being punished. Turns out the Assessor just does not like LLCs and businesses 20 years ago abused some of the affordable housing laws. The portrayal of the Peaceable Kingdom also gives me hope when residents where down a property. The problems in Nampa are real. The Nampa family shelter has had long waiting lists for over ten years. The homeless student liaison for the Nampa Public Schools reported over1000 kids were homeless during the last school year—either on the street, sofa surfing, or staying in hotels. North Nampa is filled with homes passed down through one or more generations but many of the residents do not have transportation to get them to interviews. New subdivisions are developed on the edges of the town but none of those neighborhoods could be categorized as low-income. They are built for retirees moving here. What does the peaceable kingdom look like for us? I see a wide variety of housing all across the city. Some are rentals and others will be owner occupied. There are small homes and large homes. Section-eight housing is plentiful and beautiful and spread out across the city, not consolidated into specific neighborhoods. Before any new houses are built, which extend beyond the city limits, houses in old neighborhoods are refurbished. But not all of the land within the city has been covered by pavement or buildings; there are still plenty of city parks and designated green spaces and pathways connecting neighbors. Not only does everyone have a home, everyone has neighbors. I see people caring for their neighbors, caring for all of the kids in the neighborhood, having block parties, looking in on elderly neighbors, making sure that single neighbors have a place to go for Thanksgiving. We still have friends across town who we see at the gym, school, work place, and library, but we all know the people who live near us. Like the speaker in Robert Frost’s poem, Mending Wall, I have come to believe that not all broken fences/walls need to be fixed. In fact, not mending fences can lead to a wonderful transformation of space and community. Here is the end of Frost’s poem. But the church, returning to the Lord our God in this springtime for the soul, would be better tearing down fences and striving for Isaiah’s peaceable kingdom.